This is a 1954 re-release of the 1943 Columbia serial. I’ve only seen one of these posters before and that was in a museum! 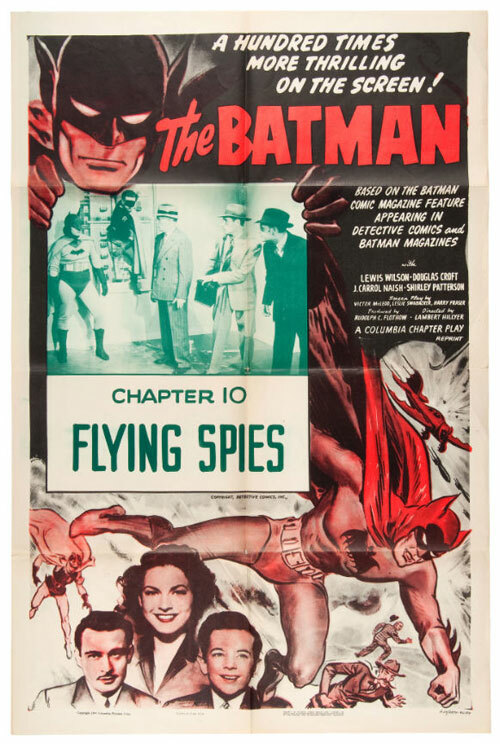 I can’t think of a better movie poster to hang in my cave–there are several items in this auction that will get bids from me, and this is probably one of them. Speaking of movie posters, check out this Italian insert poster from 1966. 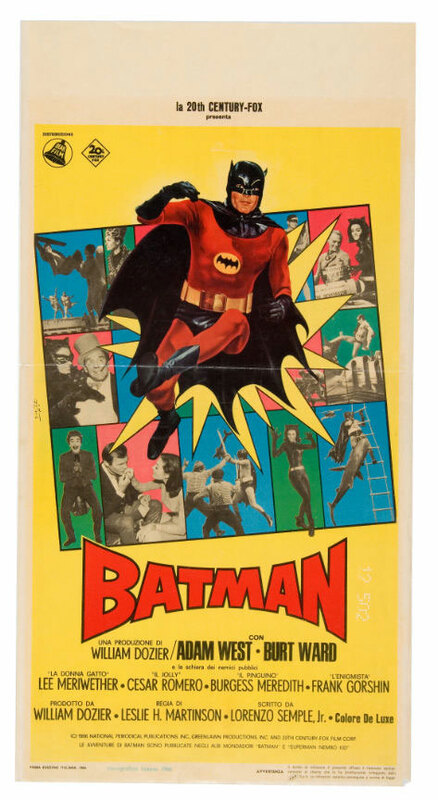 I’ve always wondered why Batman’s suit is red in the Italian posters. Insert posters are great because they take up less wall space, which is always at a premium around here! Now, there are holy grails and then there are HOLY GRAILS BATMAN! 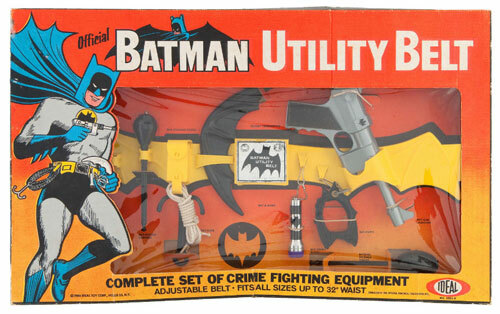 This utility belt set by the Ideal Toy Company is rarer than rare in any condition. This box is over two feet long and is one of only a few known examples to exist in this condition, and would be the highlight of any Batman collector’s collection. Considering that the current auction price is three times what I paid for my first car, It’s a safe bet that I will not be bidding on this one, but a man can dream, can’t he? Remember when Batman used to take down all the bad guys with a machine gun? 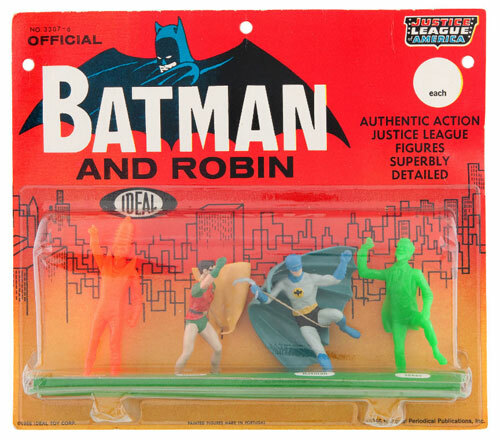 This is another beautiful example of the awesome Batman toys that were released in 1966. This is a battery operated gun that had lights and made noise while shooting spring-loaded rockets. This is another extremely rare item — this is only the second example Hake’s has offered in 47 years of auctions! I don’t usually care for rack toys or anything with a blister bubble but look at this thing. How is it possible that the plastic is still so clear after almost 50 years? The painted versions of these figures are extremely rare and were only available in the four-packs. “BATMOBILE” COMPLETE BOXED FIRST ISSUE CORGI DIE-CAST VEHICLE. 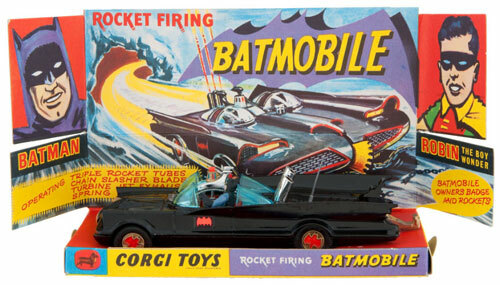 I came very close to owning one of these Corgi Batmobiles once, and I hope that wasn’t the only chance I will ever have of finding one for a price I can afford. This car is the holy grail of Batmobiles for many collectors — Corgi has produced some amazing diecast cars but this is the one everybody wants. This marble maze is an item I have had my eye on for a while, and there’s a good chance that I’ll be bidding on this one. Fingers crossed! 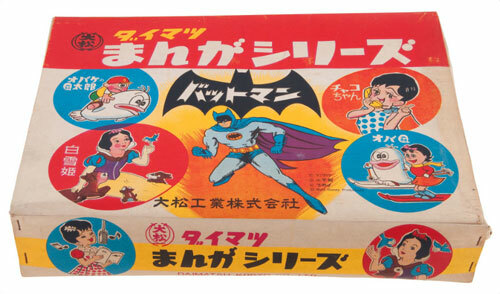 The longer I collect Batman items, the more and more attractive the Japanese items look. What the heck is going on with this box of shoes, with Batman and Snow White on it? I don’t know, but I love it! Yes, I would absolutely buy a 50-year old box of shoes. 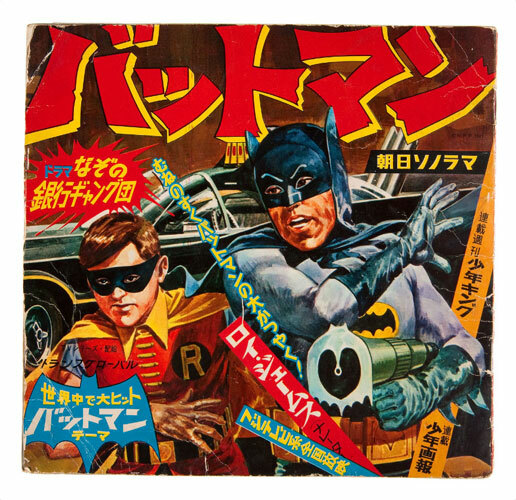 Here’s a prime example of how amazing Batman looked in 1960’s Japan. Click through the link above to see even more artwork from this incredible record storybook. 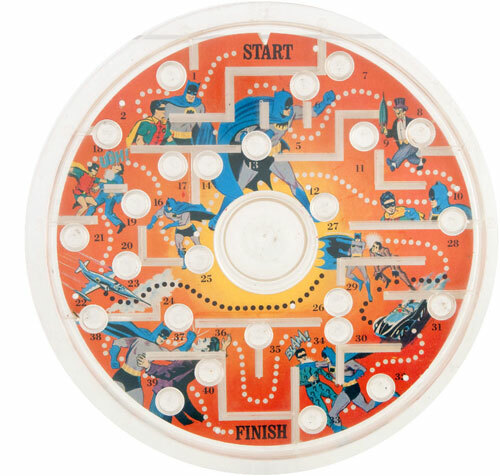 Probably the best thing about this item is that it is from the collection of Chip Kidd, the guy who literally wrote the book on Bat-Manga. There are so many great Batman items out there, it makes me excited as a collector just knowing these kinds of things exist. This post is part of the League of Extraordinary Bloggers‘ weekly challenge. Check out the items other bloggers found at Hake’s auction. Some truly awesome items. Good luck with the auctions! Brian, if you buy that Batman Italian movie poster, I will have West and Ward sign it for you as they will be guests at C2E2 in Chicago the last weekend in April! Wow, Grey that is an enticing offer. Thanks! Amazing stuff. My late father turned me on to movie serials back in the MATINEE AT THE BIJOU days on PBS. I would love that serial poster for my cave too. I’ve caught a few serials on Youtube and always imagine how great it must have been to be a kid in the 50’s going to the theater on Saturday afternoons and seeing all those cliffhangers week after week! Their site helped me figure out the identity of a obscure Batman collectible that I have had sitting around for years. I have the Batman/Joker piece of the Batman Batarang Toss Game. I haven’t even seen it posted anywhere else! Someone’s full game went for over $400 at Hakes!